The following blog post is written byAlison Davies, user researcher. I set a survey up and that was it, ready to go. The survey was based on the 2013 version, but I’d added a few more fields into it (any excuse to get more feedback). The survey was sent out via email and social media; those who completed the survey were asked if they were interested in taking part in a follow-up telephone interview. We had just short of 1,000 responses. To say I was overwhelmed was an understatement, not just in terms of the number of responses, but the number of people who were willing to help with this. My analysis tools pretty much consisted of a rather large pile of post-its, some glittery pens, a wall that was going spare and what felt like the biggest spreadsheet of information in the world. We’d had some discussion around the possibility of new personas, as well as validation of the current 3 – the information forager, expert analyst and inquiring citizen. Were these still valid? Had things changed? I spent hour after hour looking through the responses, grouping each one into what was their more likely category based on the variety of answers they’d given. 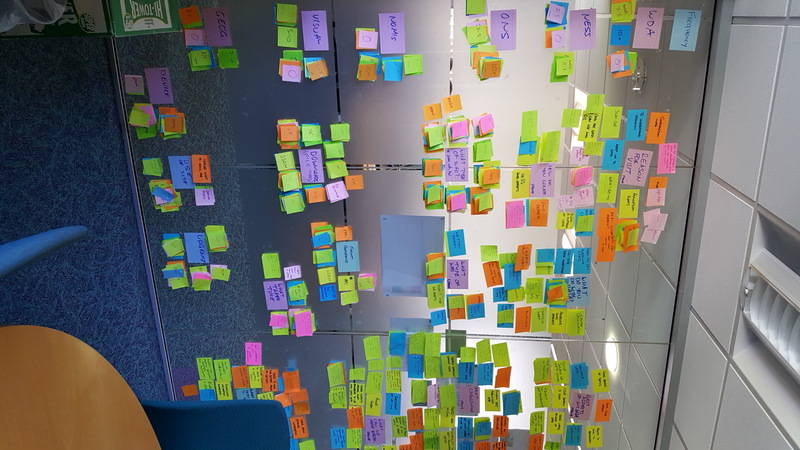 Then I started a ‘wallpapering with post-it notes’ exercise to pull out the recurring themes – each persona type had its own colour (must note for next time to make sure there’s enough difference in colour between green and yellow). We’ve now gone from 3 to 5 personas – with the policymaker and technical user joining the original cast. One of the early questions has been why the need for expert and technical – aren’t they the same? The information we have so far suggests not. The actions can be quite different – namely, in the time period in which our statistics are required and the awareness of the exact dataset they need. The technical user may be expert at what they do with the data, but they may be less expert in looking for the base data, and there isn’t the urgency that we see from the expert analyst. They don’t tend to use written publications at all – they are data users, often using our data to feed into their self-created databanks or databases. Geography can play an important part; if our boundaries don’t match, they’ll create their own, matching and aggregating to meet their own needs. The policymaker also covers those who work within this general area – that is, policy influencers, campaigners and so on. There’s a high reliance here on official government statistics – these are trusted more by those who make the ultimate decision. They share tables, infographics and so on to include in reports and will spend time looking for something that may be of use, such as ad hoc publications. Local statistics are important – policymakers use these data for benchmarking or comparison amongst their local communities, or in neighbouring communities. We’ve got further work to validate these – we’ve worked with the original 3 for long enough now to have met many of them on our travels but it’s important to keep them fresh. Needs and technology change rapidly, and although the fundamental actions haven’t really changed, what’s to say they won’t change tomorrow? As we found previously, people can switch between personas – we’ve found this out through the user testing sessions we’ve held around the country. We’ve got some help on the validation front from elsewhere in our division and this will help us explore the policymaker area. As we’ve said recently, we’re embarking on a data discovery project and this should open some leads into the technical user area for us. We have over 1,000 of our website users signed up to take part in user testing. We can use the information supplied within the sign-up survey to place them into each persona group, so we know we’re testing the right content with the right user groups. If you’d like to join our register you’d be hugely welcome.